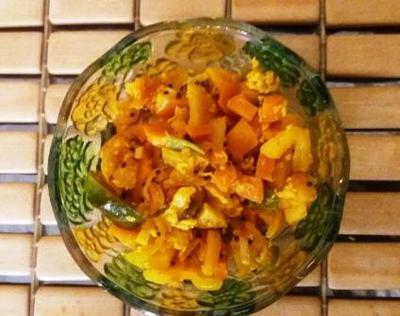 Apple thoran is a tasty side dish and it can be used with rice. It is very easy to prepare. 1) In a kadai, add oil and when it is hot, add mustard seeds. When it splutters add urad dal and curry leaves and stir it. 2) Add finely chopped onion and stir for 2 minutes. Lower the flame. 3) Add turmeric powder and chilli powder and stir. 3) Add all other items in (A) and mix well, and cover it up. Cook in medium flame. 4) After 2-3 minutes, remove the cover and stir it. 5) Close it again and keep it for about 3 minutes in low flame. 6) Remove the cover and Apple thoran is ready to use.